Naples, Fla. (August 24, 2018) - According to the National Association of REALTORS July market report, existing home sales in America decreased for the third straight month as a result of the severe housing shortage that is not releasing its grip on the nation's housing market. Conversely, homes sales in the Naples area were up 8 percent in July according to the July 2018 Market Report released by the Naples Area Board of REALTORS® (NABOR®), which tracks home listings and sales within Collier County (excluding Marco Island). The nation has only a 4.3-month supply of home inventory, while Naples has a healthier 6.25-month supply of inventory. "The Naples area overall median home price increase in July 2018 seems to be the only statistical category where we match national trends," said Kathy Zorn, broker/owner, Better Homes and Gardens Real Estate Pristine, "Naples saw an 8 percent increase in its overall median closed price in July 2018 compared to July 2017; whereas nationally, median closed prices went up just 4 percent. But median closed prices for properties over $300,000 in the Naples area decreased 2 percent in July 2018 compared to July 2017." 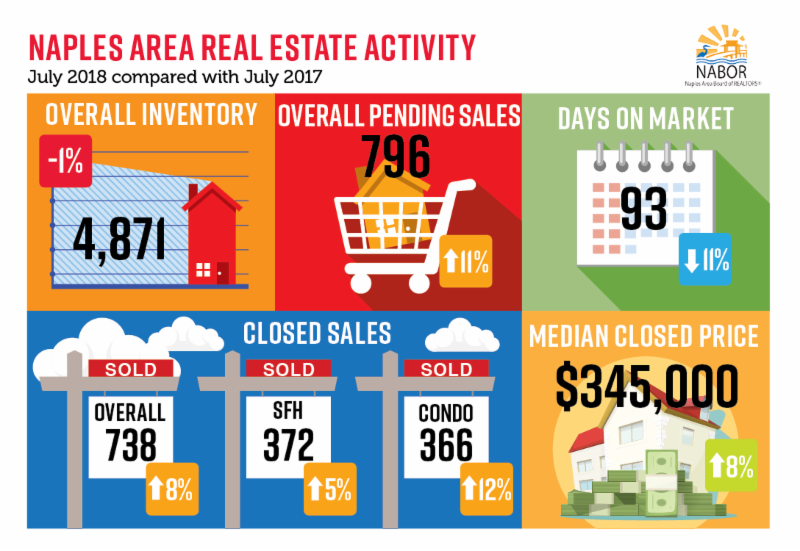 Interestingly, while July's overall inventory fell 1 percent to 4,871 properties from 4,928 properties in July 2017, inventory increased 5 percent in the $300,000 and below price category. In fact, inventory for single-family homes in this price category jumped 21 percent in July to 345 from 286 in July 2017. "There are 1,154 single family homes and 1,722 condos for sale under $500,000 currently," said Brenda Fioretti, Managing Broker at Berkshire Hathaway HomeServices Florida Realty. "Economists predict home sales in America during 2018 will not be as good as 2017. However, we're seeing the opposite in the Naples area. Granted our sales were hampered by a hurricane in 2017, but there are no signs that interest in buying a home in Naples this year might drop because of temporary climate or environmental phenomena. We have a healthy inventory, an increase in closed sales, price stability and a decrease in the days on the market compared to July 2017." July also saw a huge 39 percent jump in condominium closings in the Naples Beach area. Closed sales for August look strong too in this segment as pending sales for condominiums in the Naples Beach area increased 55 percent in July 2018 over July 2017! Overall pending sales in Naples were up 11 percent in July, with only one price segment ($500k-$1M) reporting a decrease compared to July 2017. "Pending sales for luxury condominiums [$2 million and above] in July were up 150 percent," said Budge Huskey, President, Premier Sotheby's International Realty. "The strength of the luxury market segment for both single family and condos continued into the summer months, a reflection of sustained confidence among the affluent witnessing the longest economic expansion cycle in the nation's history and record corporate earnings." How buyers are purchasing homes in Naples is very different than the national average home buyer, as well. Cash sales accounted for only 20 percent of home purchases in July nationally. But in Naples, cash sales accounted for 50 percent of all home sales in July. According to Cindy Carroll, SRA, with the real estate appraisal and consultancy firm Carroll & Carroll, Inc., inventory in neighborhoods west of US 41 are beginning to tighten. "I think we can expect some upward price pressure in areas where the inventory supply level is below 4 months, like Pelican Bay." Carroll also noted that the number of affordable homes in areas like Golden Gate City and South Naples is growing. "In April 2018, Golden Gate City had a 1.3-month supply of inventory; today it's at a 3.7-month supply. While a majority are priced on the high end of the $0-$300,000 price category, it might still provide some new opportunities for first-time homebuyers." In response to the question of whether home sales will be affected by a longer-than-average red tide occurrence, Huskey responded, "Clearly it's a situation we are all watching closely, yet currently there's no reflection in the pace of home sales. While impossible to ignore if at the beach on a day in which it's more prominent, a block or two east you wouldn't be aware of any issue and inland sales represent the vast majority of all activity in the market."